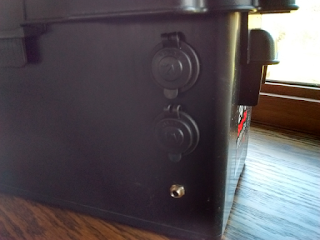 The Battery Box got one refinement over the last couple of weeks: A built-in 7.5VDC power supply. As I said, it's a tiny LED! It's just bright enough to let you know that the converter is active. 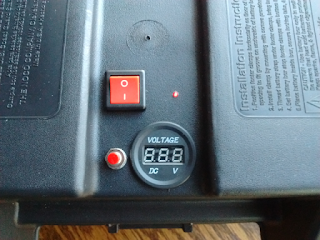 12V sockets (above) and new 7.5V socket (below). I made an extension patch cord that fits the plug and the power cord from the camera's dummy battery; this will permit me to use other power supplies. One other add-on is intended to make this easier to use: An accessory cable for my charger that will let it charge through one of the sockets. Because this is a small battery it can be charged at a relatively low amperage of 1.1A. While I haven't yet recharged it from a state of deep discharge, I'm hoping that it will remain cool during charging even when left in the box. It's my hope to never need to remove the cover. NEXT UP: It's the Messier Marathon, April 8 or 9! I plan on imaging some Messier galaxies as a part of the Arp galaxy imaging project. There are six Messier/Arp galaxies I haven't imaged yet: 49, 60, 65, 66, 77, 87, and 90. Only 77 is badly placed; it will set too soon for imaging. Because it's a marathon night, I'll shoot only luminance with my ST-8300M, and probably only an hour apiece at most using my TV102. Last year the MM had only so-so skies. Here in Minnesota we're overdue for some good Messier luck.